The Bombardment of Algiers (August 27, 1816) was an attempt by Britain to end the slavery practices of the Dey of Algiers. 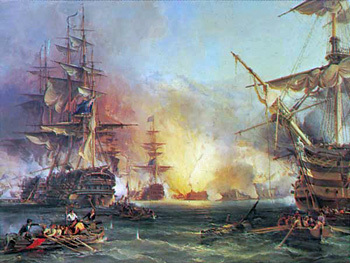 An Anglo-Dutch fleet, under the command of Admiral Lord Exmouth, bombarded ships and the harbour defences of Algiers. This particular painting was produced in 1836 by George Chambers, Senior.